All posts by: "Morpeth Fair Day Team"
A big thank you to everyone who is joining us on Sunday 11th June either as a stallholder or as a volunteer, it’s going to be a fabulous day and the Fair Day Team can’t wait! Your site pass will advise you of the time you need to arrive at Fair Day to set up and which entrance to go to. Many thanks, the Fair Day Team! Only a few weeks to go……. As I’m sure most of you know Morpeth fair day has been a key attraction for thousands of visitors to Morpeth for approximately 30 years and this year is set to be another fantastic day, with attractions for all the family to enjoy! The fair is the Morpeth and District Chamber of Trade’s annual flagship event and regularly attracts over 30,000 visitors to the town. With plenty of entertainment, interesting stalls, displays, games, rides and activities, there is something for visitors of all ages to enjoy throughout the day. Click here to find out more. The fair officially opens at 10am with the Mayor performing the main stage opening ceremony, closely followed by the children’s fun run which is open to all children in year 8 and below. Registration is from 9:30am at the Newgate Street Food Court Marquee on Fair Day with the race starting at 10.15am from the Main Stage. Every child who finishes the race will receive a goody bag and certificate and there is a free Morpeth Harriers membership to leading finishers (who are not already members). Music, dance and demonstrations will also be taking place from the main stage throughout the fair including Memphis Suns, Ashington Colliery Brass Band, King Edward Steel Band and Jason King! And of course Turners Funfair will be taking up their usual spot on Newmarket, providing rides, thrills and attractions. The Morpeth Fair Day Parade is also a big highlight of the day and a great opportunity to see classic cars and bikes. The parade will start at 11:45am and follow its usual route through Morpeth to the Stanners, where visitors can see the cars and bikes displayed. A great attraction for car and bike enthusiasts! There is still time to register to take part in the parade, for more information click here. Entry forms will be available for completion on the day. Contestants will be charged £1 per entry for each category and all monies will go to charity. There will be rosettes and goodie bags available for 1st, 2nd and 3rd place for each category and a best in show prize and rosette. The Newgate Street Food Court is also returning this year, with a wide array of food options from breakfast, to pizza, to noodles. All with music and a comfortable seating area to share and enjoy your food with family and friends throughout the day. For more information and to keep up to date with what is happening, how to find us, where to park and more, visit our website www.morpethfairday.co.uk or check out our Facebook and Twitter pages. We can’t wait to see you on Sunday 11th June! Don’t forget to share your photos and tag us on Facebook and Twitter, we would love to hear what you enjoy about Morpeth Fair Day. Time is marching on and the Morpeth Fair Day Team can’t believe its only two months to go! Sunday the 11th June (10am – 4:30pm) is so close and we have an exciting event to let you know about…. Entry forms will be available for completion on the day and will need to be completed at least one hour before the event, but the earlier the better. Contestants will be charged £1 per entry for each category and all monies will go to charity. There will be rosettes and goodie bags available for 1st, 2nd and 3rd place for each category and a best in show prize and rosette. We are really excited about this new addition to the fair and can’t wait to see all of the contestants on the day! Don’t forget to share you pictures from the day via our Facebook and Twitter pages! Do you know that Morpeth Fair Day is organised and managed by volunteers from Morpeth and District Chamber of Trade? The Chamber doesn’t have anyone working on fair day full time, it is all done by wonderful people who give up their free time through out the year to plan, prepare and deliver fair day for residents, visitors and businesses in the town and local area. But we need your help…..
Do you or someone you know have an interest in volunteering as a steward for few hours on Morpeth Fair Day? You don’t need any specific experience and you will receive the support of the fair day team. Your role will include answering visitor questions, ensuring a safe set up and closing of the day, directing traffic and manning road closure barriers. Stewards can volunteer for just an hour of the day – to the full day, we would love to hear from you if you would be interested in helping out. We also offer a cuppa and a sandwich as a thank you for your help. If you would like more information about how you could get involved in volunteering please contact us by completing a volunteer enquiry form on our website (http://morpethfairday.co.uk/volunteers) or email us via info@morpethfairday.co.uk. Great news….the Morpeth Fair Day Parade is currently being organised! After 30 fantastic years of organising the Classic Car and Bike parade, Malcolm Stawart has decided to step down as coordinator and use his spare time for projects new. We would like to say a huge thank you to Malcolm for all of his hard work over the years, as a member of the fair day committee and doing such a great job of coordinating the parade. So…we have a new coordinator this year, Norman Rickard. A big welcome to Norman, who volunteered following our media campaign requesting volunteers to join the fair day committee. Norman has previous experience of event organisation and has taken part in parades and their organisation in the past. We are looking forward to seeing Norman put his stamp on the parade this year. As I’m sure you all know the Morpeth Fair Day Parade is a big highlight of the day and a great opportunity to see interesting vehicles, classic cars and bikes. The parade will be following its usual route through Morpeth to High Stanners this year, where visitors can see the vehicles displayed. Do you have an interesting vehicle or classic bike or car that you would like to parade and display during Morpeth Fair Day? If you are interested in taking part in the parade please visit our parade webpage for information and the application form! We look forward to seeing you on the 11th June 2017! The first Morpeth Fair Day Team meeting of the New Year has taken place and work is well and truly under way to make fair day 2017 a fantastic day! Sponsorship opportunities are also still available, starting from just £50. A great way to raise a businesses profile – marketing and a stall space is included in the sponsorship with recognition in the official Morpeth Fair Day programme, as well as Twitter, Facebook and via the Morpeth Fair Day website. Lots of entertainment is also being lined up, can’t give away too much just yet but we have some exciting developments this year on the Stanners and Oldgate including a vinyl record and comic book area! Of course we can’t forget the fun fair, Newgate Street Food Court, fun run or the vintage car parade either! Keep up to date with all the Morpeth Fair Day developments by checking the website and our social media pages! Happy New Year and we look forward to seeing you all on the 11th June 2017! The fair has been going now for approximately 30 years (so long we are struggling to pin down the exact year it started!) and a few long standing planning volunteers have stepped down to pursue other interests and opportunities. We are incredibly grateful to them for all of their hard work and very sad to say good bye to them after so many fabulous years working together to make fair day a great day for the town. A huge thank you to them and a big good luck for the future from the Chamber and the Fair Day Committee. Morpeth Fair Day never stands still, it is constantly evolving and developing depending on the interests of our volunteers as well as feedback from visitors and stallholders. But without enough volunteers fair day is in danger of not being deliverable in its current size and format, we need your help! Do you or someone you know have an interest in volunteering a few hours a month to help deliver Morpeth Fair Day? You don’t need any specific event planning experience and you will receive the support of the Fair Day Committee to help you learn the role and processes involved in fair day, the most important requirements you need to have are enthusiasm and the time to commit to a planning role ( fair day committee meetings are held once a month on a Tuesday evening between September and June). If you have these we would love to hear from you! As well as planning roles we also need volunteers on the day to be stewards, answering visitor questions, ensuring a safe set up and closing of the day, directing traffic and manning road closure barriers. Stewards can volunteer for just an hour of the day – to a full day, we would love to hear from you if you would be interested in helping out during fair day. If you would like more information about how you could get involved in volunteering please contact us by completing a volunteer enquiry form or email us via info@morpethfairday.co.uk. Thank You! Planning Morpeth Fair Day 2017! A huge thank you to everyone who joined us for fair day 2016, it was another great day! But there is no rest for the Morpeth Fair Day Team, we are back to work on fair day 2017! Date for your diary: – Sunday 11th June 2017! 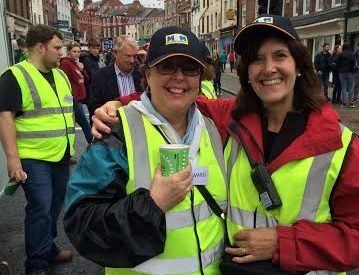 Did you know that Morpeth Fair Day is planned and delivered entirely by volunteers? It’s hard work but great fun and it’s very rewarding to be involved in. We are looking for people to help us this year, both in the planning stages and on the day. If you would like to join us and learn more about how you can get involved, please contact the team here. Stallholder applications are being accepted now, so if you would like the opportunity to promote your business or sell your products to 30,000+ visitors, visit our stallholders page for more information. If you are interested in entertaining the 30,000+ visitors during fair day get in touch! Maybe you are part of a dance or theatre group and would like to show us what you have learned, perhaps you run a different kind of exercise class and would like to promote it or are you an up and coming musician and what to increase your fan base? If you would like to take part we would love to hear from you! Morpeth Fair Day attracts a vast array of stallholders and attractions, do you have something we haven’t seen before? We would love to receive applications for new and innovative stalls and attractions! Perhaps you are part of a local sporting group and have an idea of how to raise your profile via your sport, maybe you are a charity and have someone who wants to sit in a bath tub of beans or maybe you breed weird and wonderful animals that visitors would love to learn about…..the possibilities are endless! Returning this year is the Newgate Street Found Court! We loved this last year and we are looking forward to bringing it back again, make sure you come hungry! We have a few new ideas up our sleeves for this year, which are excited about…..can’t give too much away just yet but we think you are going to love them. Well that’s it for now folks, stay tuned to our social media sites for updates! There is so much going on this year, we don’t know where to begin with updates! But we will give it a good go…. You may remember a few years ago street performer Rob Roy Collins wowed the crowds at Morpeth Fair Day, well we are pleased to announce that he will be returning this year! Combining comedy, escapology and acrobatics, there will be a perfect blend of laughter, danger and excitement for you to enjoy in amazement and hysterics. If you would like to take part, get in touch with your local. Once your team has been decided compete the form here to enter, the deadline for applications is the 21st May 2016! Don’t forget that the Morpeth Antiquarian Society will also be holding their annual local history exhibition in the Town Hall between 10am and 5pm on Saturday 11th and 10am to 4.30pm on Sunday 12th June 2016, with free admission and refreshments available. Conflict and Fire includes Morpeth in the First World War; the Somme; Battle of Jutland; plus Fires of Morpeth from the great King John fire of 1216 to Oliver’s Mill. The vintage car parade and display is also back this year – applications are available now if you would like to take part, contact us for further details. And of course there is always the fun fair! Rides galore to thrill and delight you. Out of Sight – If you are a Robbie Williams or Dizzy Rascal fan you may remember their DVD ‘Going Crazy’, where Robbie found a new mode of transport – a ‘blinged up’ mobility scooter! The charity Out of Sight have received this mobility scooter as a donation and will be inviting Morpeth Fair Day visitors to sit on it and take pictures. Out of Sight are working hard to raise money for a wheelchair adapted static caravan for respite care. To learn more about the charity visit their Just Giving Page here. Newgate Street Food Court – we can’t forget our exciting food court this year, with a host of interesting food options for you to enjoy from wood fired pizza to amazing vegetarian/vegan salads! Whatever the weather decides to do this year, there will be a seated marquee area to shelter from sun or rain and enjoy your delicious purchases. A big thank you to our additional sponsors Heighley Gate, the Riverside Lodge, Morrisons Morpeth and Coca Cola Morpeth- without your support we couldn’t make Morpeth Fair Day such a fantastic day! Interested in sponsoring Morpeth Fair Day? Opportunities are available from as little as £50 with benefits such as recognition of sponsorship in the official Morpeth Fair Day program of events – a marketing opportunity not to be missed! Contact the Fair Day Team for more information. Morpeth Fair Day is organised and run completely by volunteers. Fair Day just couldn’t continue without the amazing efforts of our volunteers (thanks guys)! Would you be interested in helping out on Fair Day as a marshal, helping to keep everyone safe and sound through out the day? It’s a great opportunity to get involved in Fair Day, help the community and enjoy the day from the front line – we also throw in a drink and sarnie! Whether you can help for an hour or all day we would love to hear from you, contact us for more details. Well we think that just about covers it for now folks – keep an eye out on our social media platforms and website for additional info.